In September 1978, the British Ministry of Defence placed an order with the Royal Ordnance Factory Leeds for the supply of 243 Challenger 1s, essentially a further development of the Shir 2 originally developed for Iran. This order was valued at £300 million. The Challenger 1 was accepted by the General Staff in December 1982 by which time production was already well underway at Royal Ordnance Leeds. 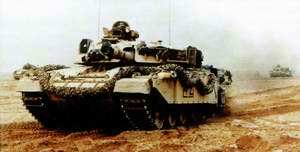 The first British Army order for Challenger 1 was for 243 tanks, sufficientto equip four regiments. The first of these was handed over to the British Army by Royal Ordnance Leeds in March 1983. In June 1984, the MoD placed an order for an additional 64 Challenger 1 MBTs, sufficient to equip a fifth regiment in BAOR. The Royal Tank Regiment received its first vehicles late in 1984 and by May 1985 the Royal Hussars were completely equipped with the Challenger 1 MBT. A further 18 tanks were ordered in June 1985. In June 1986, Royal Ordnance Weapons and Fighting Vehicle Division took over responsibility for design authority and future post-design services work on Challenger 1. This was previously undertaken by the Royal Armament Research and Development Establishment at Chertsey. In July 1986, it was announced that Vickers Defence Systems was to buy the Royal Ordnance Leeds tank factory for approximately £11 million and that a new facility, identical to Vickers Defence Systems Armstrong Works at Newcastle-upon-Tyne, would be built at a cost of £14 million. The new Vickers Defence Systems Leeds factory was fully operational by late 1987. 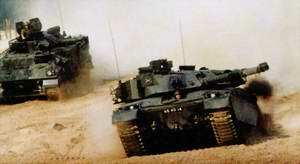 At the same time, the UK MoD placed a further order for 76 Challenger 1 MBTs at a cost of £100 million. The last of 420 Challenger 1s was scheduled for delivery to the British Army in September 1989 but this was subsequently stretched until mid-1990. Under current plans, the Challenger 1 will now be replaced by the Challenger 2 MBT to allow the Challenger 1 MBT to be phased out of service by the year 2000/2001, although some chassis could be refitted to undertake the AVLB and AVRE roles currently undertaken by the Chieftain. Challenger 1 MBTs are deployed by the British Army in Germany and the UK in an operational role and in Canada at the British Army Training Unit, Suffield. More recently a number of Vickers Defence Systems Challenger 1 MBTs has been deployed to Bosnia. In March 1999 it was stated that Jordan would purchase a substantial number of Challenger 1 MBTs to replace its Tariq MBTs (an upgraded Centurion tank). Challenger 1 is essentially the FV4030/3 (Shir 2) modified to suit the requirements of the British Army. The layout of Challenger 1 is similar to that of the Chieftain, with the driver's compartment at the front, turret and fighting compartment in the centre, and engine and transmission at the rear. The turret and hull incorporate Chobham armour for increased battlefield survivability. The driver has a single-piece hatch cover that lifts and swings forward horizontally allowing him to drive in the head-out position. To the rear of this is a single wide-angle periscope which can be replaced by a Pilkington Optronics Badger passive periscope for driving at night. The driver can also leave the vehicle via the fighting compartment. The commander is seated on the right of the turret with the gunner forward and below the commander and the loader on the left side of the turret. The commander originally had a modified No 15 cupola that was designated the No 32 cupola. This has a No 37 day sight which is capable of being quickly replaced by a Rank Pullin image intensification swap sight. The tank commander also has nine periscopes for all-round observation. The No 37 swap sight was an interim solution as in July 1981 the MoD awarded a development contract to Barr & Stroud (now Pilkington Optronics) for the Thermal Imaging Surveillance and Gun Sighting Sights (also known as TOGS - Thermal Observation and Gunnery Sight). The turret had been designed to accept this system when it was available. A single thermal imager in an armoured box on the right of the turret provides separate outputs for both commander and gunner in the relaxed observation mode or as a gunsight. In April 1987, the UK MoD announced that orders had been placed for the final production batches of the Thermal Observation and Gunnery Sights worth about £35 million. This order completed the buy of TOGS for the British Army's Challenger 1 and Chieftain fleets. Half the order was placed with Barr & Stroud, the original producer of the system, with half going to Avimo. This was the third order for TOGS and Barr & Stroud supplied 85 per cent of the MoD's total TOGS requirement. The loader has a roof-mounted x1 periscope swivel-mounted forward of the two-piece hatch cover that opens front and rear. A 7.62 mm L8A2 machine gun is mounted coaxially with the main armament and a 7.62 mm L37A2 machine gun is mounted at the commander's cupola. Mounted either side at the front of the turret is a cluster of five electrically operated smoke grenade dischargers, each with a coverage of 100°. The Challenger 1 has the former GEC-Marconi Radar and Defence Systems, Defence Control Systems Division, Improved Fire-Control System (IFCS), which is fully described in the entry for the Chieftain MBT and has a target tracking rate of 30 mils/s in traverse and 10 mils/s in elevation. Slewing rate in traverse is 0.2 to 480 mils/s and 0.2 to 200 mils/s in elevation. The gun control system is also similar to the Chieftain's but a number of units have been redesigned to replace the thermionic valve equipment with solid-state equivalents. The gunner has a periscope Pilkington Optronics Tank Laser Sight No 10 Mark 1 with a magnification of xT and x10 with an 8.5° field of view. The laser rangefinder is an Nd:YAG unit with an operating range of 300 to 10,000 m and an accuracy of ±10 m for 90 per cent of shots. The gunner also has an emergency No 87 periscopic sight. This is stowed under armour but can quickly be deployed and collimated with the gun. It projects through an armoured hatch in the turret roof, rather than a conventional telescope as used in Chieftain, to avoid detracting from the frontal integrity of the armour. Mounted at the rear of the turret is an NBC environmental control system. Challenger 1 is powered by a Perkins Engines Company Condor V-12 1200 diesel developing 1,200 bhp at 2,300 rpm, which is fitted with two Garrett-AiResearch turbochargers. The transmission is a David Brown Defence Equipment Limited TN37. Torque converter is a Borg-Warner with lock-up clutch giving four forward and three reverse gears. Steering is a Commercial Hydraulics STN37 double differential with hydrostatic, infinitely variable control. The hydropneumatic suspension of Challenger 1 was designed and developed by MVEE in conjunction with Air-Log Limited (originally Laser Engineering (Development)), with production being undertaken by Vickers Defence Systems. Challenger 1 has six aluminium roadwheels with the drive sprocket at the rear, idler at the front and two track-return rollers either side. The upper part of the track is covered by conventional aluminium skirts similar to those fitted to the Chieftain. In times of crisis or war these would be replaced by skirts incorporating Chobham armour which were first deployed during the 1990-91 Gulf War. The tracks of the Challenger 1 are of a new design and are not interchangeable with those fitted to the Chieftain. The Challenger 1 Improvement Programme (CHIP) covered two key areas, automotive and weapon system enhancements. Some of these have already been incorporated into the Challenger 1 MBT but, with the introduction of the Challenger 2, no further enhancements to the Challenger 1 are being carried out, as the vehicle will be phased out of service in the future. Challenger 1 MBTs were deployed to Saudi Arabia late in 1990 and subsequently took part in Operation Desert Storm. The 7th Armoured Brigade deployed two regiments of Challenger 1 MBTs each with 57 MBTs (four squadrons) while the fourth brigade deployed one regiment of Challenger 1 MBTs with 43 MBTs (three squadrons). Challenger Armoured Repair and Recovery Vehicles were also deployed, as were additional Challenger 1 MBTs, as battlefield replacement vehicles. In early 1991, these were improved in a number of key areas including the installation of Royal Ordnance Explosive Reactive Armour (ERA) on the nose and glacis plate and Vickers Defence Systems passive armour along the sides of the hull. Royal Ordnance also improved the firepower of the Challenger 1 120 mm L11 rifled tank gun with a new projectile and charge system. The new APFSDS projectile gave greater accuracy and penetration and incorporated features of the new system developed for the L30A1 rifled tank gun installed in the Challenger 2. The charge was designated the L14A1 and the depleted uranium projectile the XL26E1. During Operation Desert Storm not a single Challenger 1 MBT was knocked out by Iraqi forces but they destroyed some 300 Iraqi MBTs. In February 1988, the British Army placed an order with Vickers Defence Systems at Leeds for the supply of 17 Challenger Training Tanks valued at £18 million. The first Challenger Training Tank (CTT) was completed in August 1989 with the main production run being carried out between May and September 1990. The vehicles are used to provide realistic driver and maintenance training at Royal Armoured Corps and Royal Electrical and Mechanical Engineer Establishments. The CTT is the first vehicle of its type to be used by the British Army and replaced Challenger 1 gun tanks then being used for this role. As the CTT weighs the same as the Challenger 1 MBT the automotive performance of the two vehicles is identical. In addition to being used for driver training, the CTT can be used for maintenance training, MBT recovery or as a dozer vehicle. The CTT is essentially a Challenger 1 MBT with its turret replaced with a new non-rotating turret that accommodates an instructor and up to four students. The new turret provides roll-over protection and the instructor has duplicate instrumentation and controls that allow him to control turret equipment, monitor the driver's performance and inject automotive faults into the driver's instrument panel. In an emergency the instructor can also stop the vehicle. Early in 1990, the British Army selected the Pearson Combat Dozer Blade (UDK1) for service on its Challenger 1 MBTs and every Challenger 1 in the British Army has been modified to accept it. Typical roles of the UDK1 include digging hull down fighting positions, crossing anti-tank ditches and similar obstacles, construction of defensive earthworks, removing obstacles and creating roadways for follow-on vehicles through wood, bush and difficult terrain. The dozer can be mounted on or removed from the Challenger 1 MBT in under 15 minutes and it is fully interchangeable with other equipment such as the Pearson mine plough. The dozer unit contains its own power pack with only electrical power being required from the vehicle. The UDK1 is also fitted to the Chieftain Armoured Vehicle Royal Engineers developed by Vickers Defence Systems for the British Army. Full details of this are given in the Chieftain entry later in this section. Details of this future programme forthe British Army are given in the previous entry. In June 1985, the Marconi Electronics, Land and Naval Systems Group Marksman twin 35 mm anti-aircraft turret was taken to Leeds mounted on a Centurion tank chassis which had been used for firing trials. The complete turret was then transferred to the Challenger 1 MBT hull which had been fitted with a suitable adaptor ring. This took 1 hour 29 minutes, after which Challenger 1 Marksman was taken out and driven at speed on the test track facility. While on the test track the radar was operating and the gun stabilisation system was successfully tested. In late summer 1985 a second Marksman turret was integrated with a Challenger 1 chassis for Proof and Endurance trials. The trials were successfully completed and demonstrated that Challenger 1 provided a suitable firing platform for the Marksman turret. Full details of the Marksman twin 35 mm anti-aircraft turret are given in Jane's Land-Based Air Defence 1999-2000, pages 83 to 85. The only user so far is Finland who has fitted them to T-55 series MBT chassis. Production complete. In service with the British Army. Being replaced by the Vickers Defence Systems Challenger 2 MBT. A quantity has also been purchased by Jordan.